If you are getting low and distorted sound when recording your microphone on Windows 10 then please follow the steps below. Right click on the Sound icon in the bottom right of your screen on the desktop. Right click on the microphone. Check the 'Disable' box inside the box. If you don't see an Enhancements tab, then look for a "Signal Enhancements" section in the "Advanced" tab. 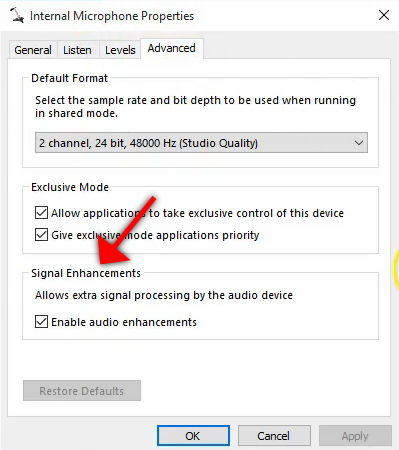 Remove the check from the "Enable Audio enhancements" box, pictured below.